New UN Habitat Executive Director Appointed! 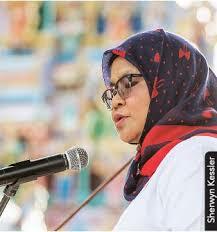 Dato’ Maimunah Mohd Sharif is the new Executive Director of UN-Habitat. she will have a huge challenge to rebuild the UN body after Dr. Clos's tenure. Prior to this appointment, she was the Mayor of the Penang City Council. She holds a Master of Science in planning studies from University Science Malaysia, Penang and also a degree in Town Planning Studies from University of Wales Institute of Science and Technology, United Kingdom. Her career begins from 1985 to 2003 as Town Planning Officer at Municipal Council Of Penang Island. In 2003 she was promoted as a Director, Department of Planning and Development till November 2009. As a head of Planning and Development Department, she was responsible for preparation of structure plan, local plan, development controls, projects and landscapes. She also headed a team for the planning and implementation of urban renewal projects for Little India and implementation of Penang Gold Bazaar project in George Town. In November 2009, she was entrusted to establish George Town World Heritage Incorporated. As General Manager and a founder of George Town World Heritage Incorporated, a state arm company, she has the responsibility to manage the George Town World Heritage Site which was inscribed by UNESCO in July 2008. She was the precursor for the George Town Festival in 2010 and now established as the yearly event by the Penang State. With her knowledge and involvement in heritage, she was chosen by the government as one of the experts to represent Malaysia in UNESCO World Heritage Committee Meeting at St. Petersburg, Rusia in June-July 2012. She believes in the inclusive planning, development, and administration. She implements Gender Responsive Participatory Budgeting (GRPB) process in the preparation of Council yearly budget and Gender Responsive Participatory Methodology in our projects. She establishment and chair a gender Committee as a long-term goal to integrate gender perspectives into governance process and GRPB as a tool for mainstreaming gender into budgetary and development policy and planning. She has carried out dialogue budget in 2012 and it was the first MPSP budget tabled by a female President and GRPB program becoming as the yearly program for MPSP. Organization), ICLEI (International Council For Local Environmental Initiatives) and IOPD (International Observatory For Participatory Democracy). As an international recognition, she is voted as a Regional Executive Committee (REXCOM) of ICLEI in Southeast Asia on 27 November 2014. She is also voted in to represent Southeast Asia Region in the Global Executive Committee (GEXCOM) of ICLEI on 5 December 2014. She was given an award Global Human Settlements Outstanding Contribution Award by Global Forum On Human Settlements in Quito, Ecuador during the UN – Conference on Housing and Sustainable Urban Development – Habitat III on 18 October 2016 on her contribution for sustainable planning ini Seberang Perai. Next World Urban Forum will be held in Malaysia in February and the secene is set for the new ED of UNHabitat to ressurrect and reinvigorate the agency to adderss the challenges and reap the dividents of urbanisation !